I’ve been seriously considering blowing away this website and making something completely new.. And probably not WordPress-based.. (WordPress is awesome, I just am ready for something else). In the mean time, I’ve received the odd request to resurrect my site from STP users. So, for now anyway, Dawning.ca is back! I will say that quite a few months back Research in Motion had a great contest. Anyone who wrote an application for the PlayBook tablet, would be given one. So I delivered a corny app (SiteSearcher) and they sent me a Playbook. I enjoyed it for months, until it was stolen. I’ve since replaced it with an iPad Mini which I must say is pretty insanely awesome. Still, when I see a Playbook, I often imagine buying one again. But I really loved it so much because I got it for “free” (more like for ~3 hours of learning). Photo is attached as evidence that this really happened. 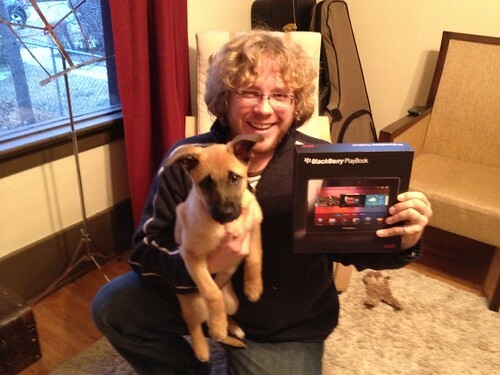 I called the photo “Victory at Sea!”, since in the same week I was sent my “free” Playbook, my best little buddy Gryphon moved in!